Foodista | Recipes, Cooking Tips, and Food News | Grilled Chicken with Warm Romaine Salad & Rice!!! Combine all of the ingredients for the marinade in a bowl and place the slices of chicken in the bowl. Refrigerate for ½ hour or longer. Heat a griddle and place the chicken on the hot griddle. Turn the chicken once, so a beautiful golden color may be achieved on both sides. Prepare the rice as directed with a dash of turmeric and all-spice in the water. Heat a large frying pan with a drizzle of olive oil and add the ingredients for the salad. Toss. When the Romaine becomes slightly soft, lift the salad out of the pan so that any water is left behind. 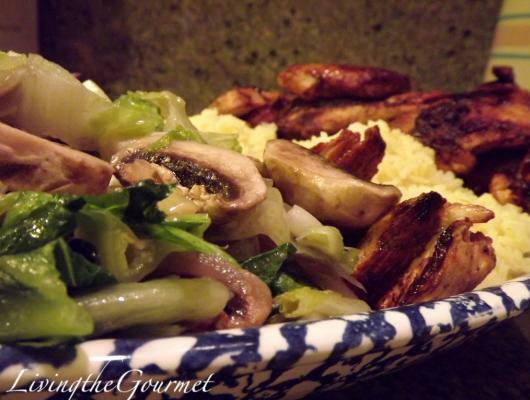 Plate the warm salad with the chicken and rice. Pour the dressing over the salad. This is a delicious and healthy way to serve up dinner.